Kitchen Update | A.B.E. Remodeling, INC.
Hello Everyone.... How do you like the note on the "Funny ecard". Well, maybe it is not funny at your house. 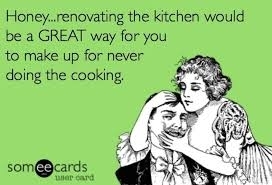 Maybe that spouse would like to have a kitchen remake or remodel. It's a good time to give us a call and discuss your thoughts. We currently have bedroom & kitchen rennovations going on..but can still make room to assist you. Maybe it's not a kitchen or bedroom you want changed....maybe it is something else. Remember that we can do it all and no job is too large or too small. Check us out. That's all for today. Folks, have a great Tuesday afternoon.